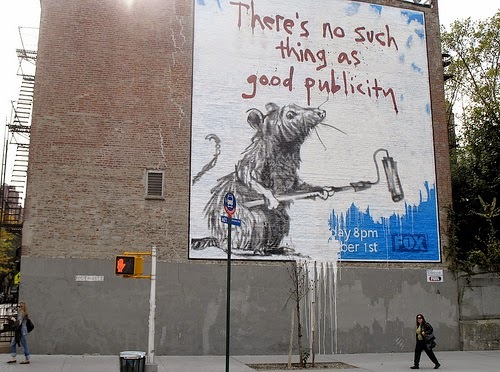 Next Monday (Nov 17th at 9pm), HBO will air it's exclusive documentary entitled Banksy Does New York. Of course, after it airs you will be able to access it on HBO GO or On Demand. I know my DVR will be set for this one. Inspired by Banksy's 2013 month long exhibit, Better Out Than In, this film profiles the street artist's residency in New York City last October. The title "Better Out Than In" is a reference to a quote by impressionist painter Paul Cézanne, "All pictures painted inside, in the studio, will never be as good as those done outside." 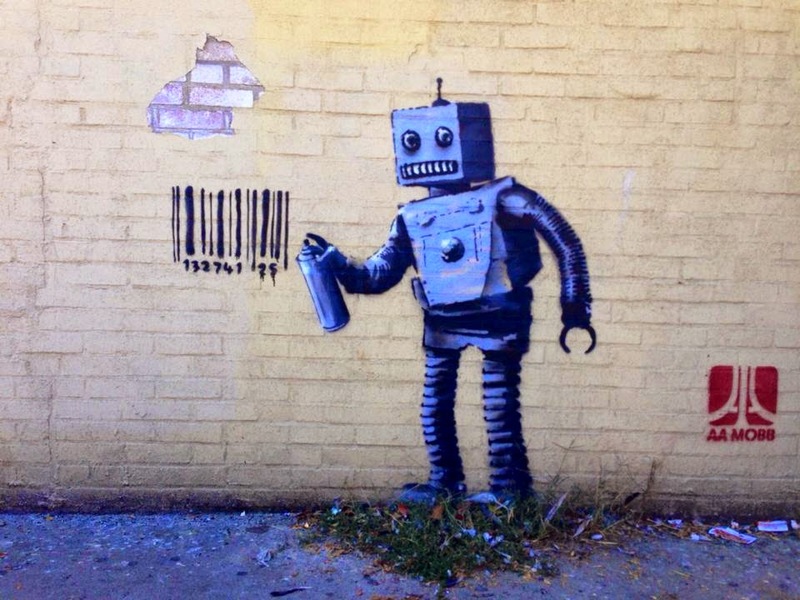 For my StellaBella readers not familiar with the pseudonym Banksy, or the work produced by said "guerrilla street artist", it's hard to nail down facts. Mostly due to the fact that he or she's identity still remains a mystery. It is believed that the artist was born in Bristol, London around 1974, and became known for provocative stenciled pieces in the late 1990s. 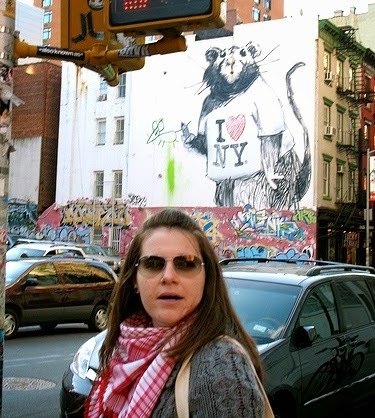 Banksy was the subject of a 2010 documentary Exit Through the Gift Shop, examining the relationship between commercial and street art (available on Netflix). 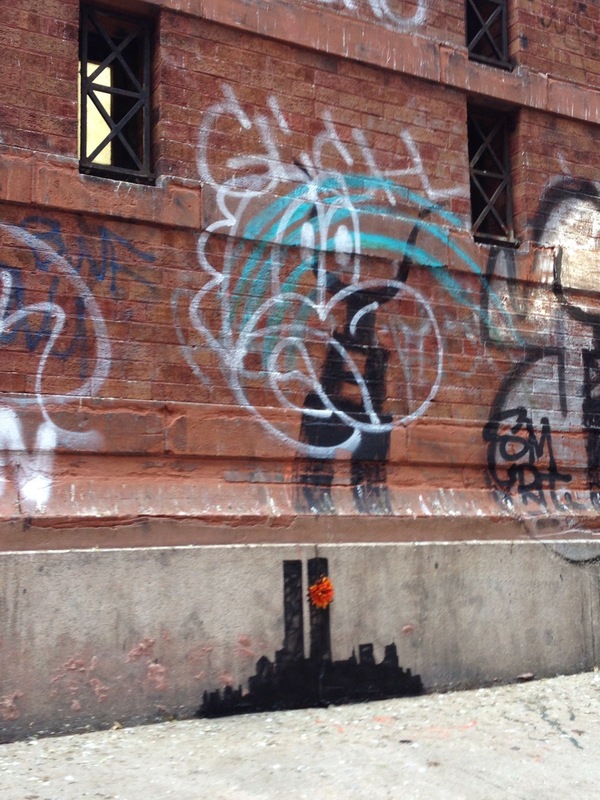 For all 31 days of the month, Banksy revealed a photo of a new piece of art on a dedicated website that was placed somewhere around New York City. Around noon, the neighborhood and image would be released. 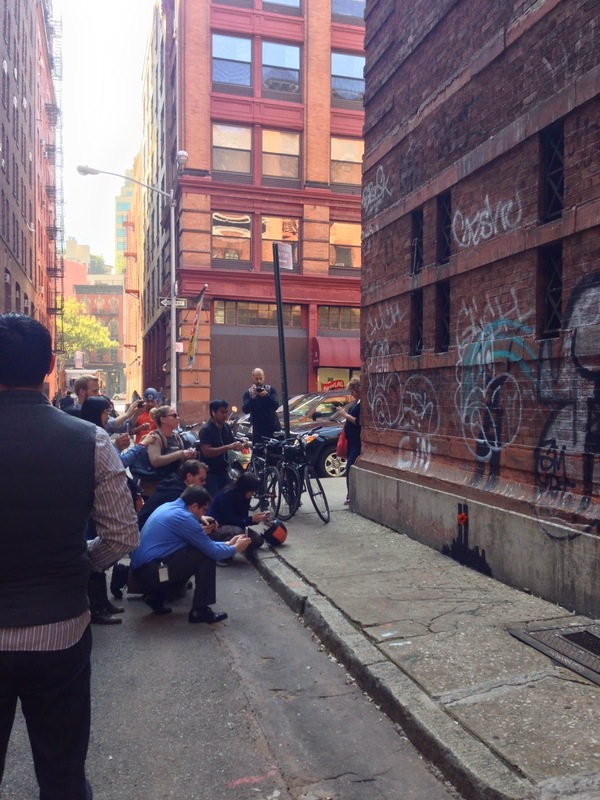 It caused an amazing flurry of interest and activity through the 5 boroughs. The documentary, is made up of collective footage from the masses and it looks fantastic! If you were not in the know that afternoon, and happen to be walking by this scene - I'm sure you wondered what the fuss was all about. Everyone gathered, spoke quietly and took pictures peacefully. All with smiles across our faces, as we embraced the lovely Fall day and the artwork that had been bestowed upon our city streets. 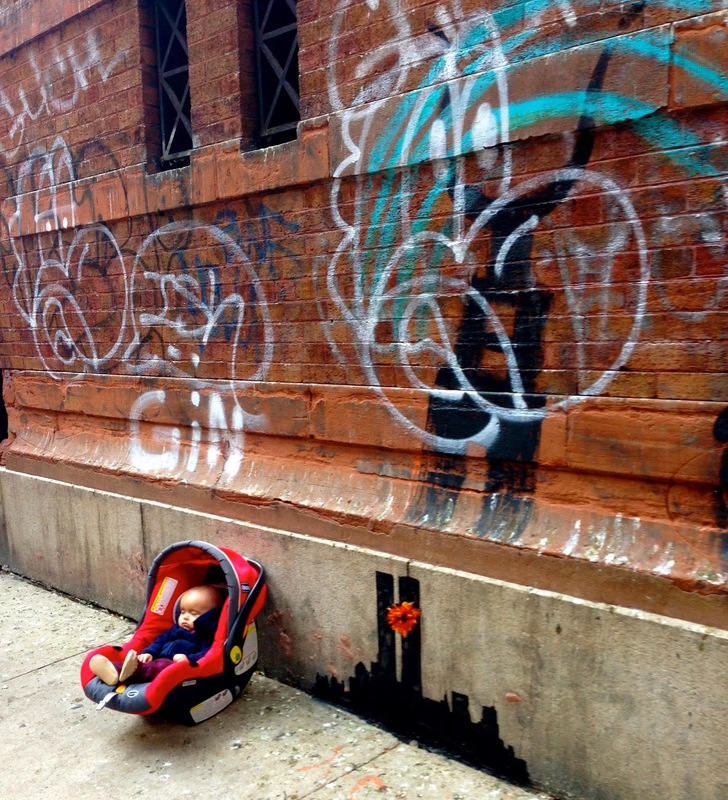 During the time I hung around the corner of Jay & Staple, I saw the infamous pug pee on the piece, and of course the adorable sleeping baby placed in front of the artwork, which everyone photographed. A few days later, a good friend & artist, Amy Karle was in town from San Francisco. 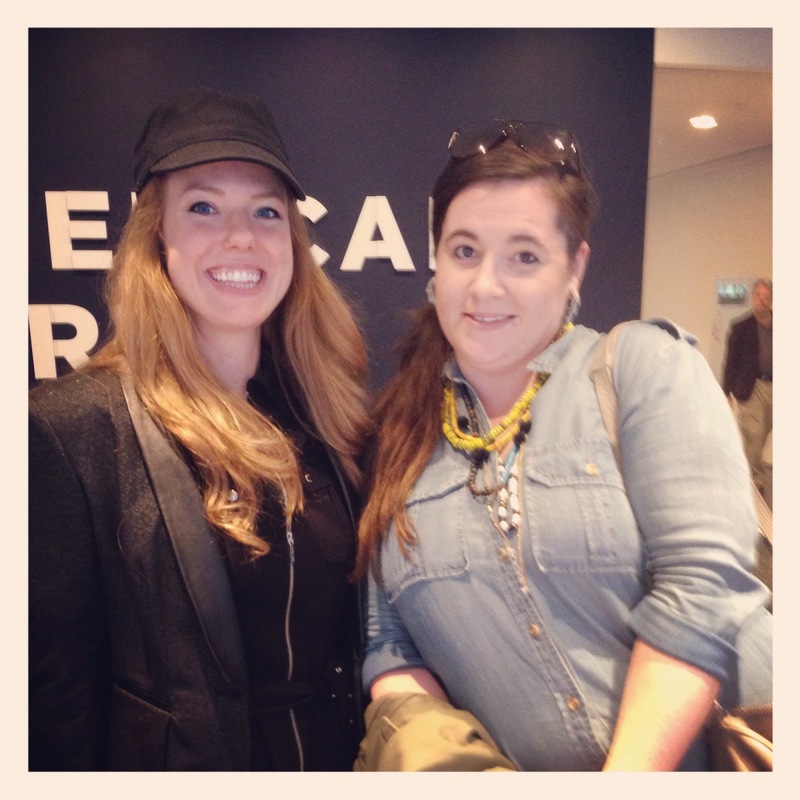 We made plans to catch up over lunch on Columbus Day, and visit the Magritte exhibit at the MoMA. Right in the middle of this city-wide phenomenon, here I was in one of the most respected modern museums in the world. We supported the arts by paying our admission fee, buying a coffee table book on the way out (which I have no problem with), but it begs the question: when did self expression get such a hefty price tag? Shouldn't art be free for all to see? Amongst many topics, Amy & I discussed the Belgian surrealist painter, and the draw compared to the excitement going on outside. And the MoMA sure does attract a crowd, it felt that each room had reached capacity as we moved through the exhibit. 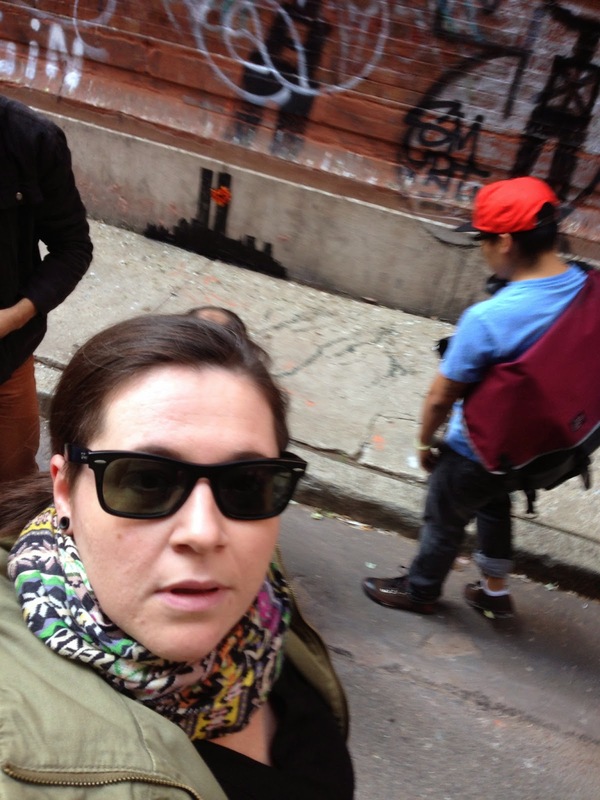 So what is the difference between the gallery, and the artwork on the street? Isn't it even more compelling to create art in a living environment than hanging it onto a blank wall? 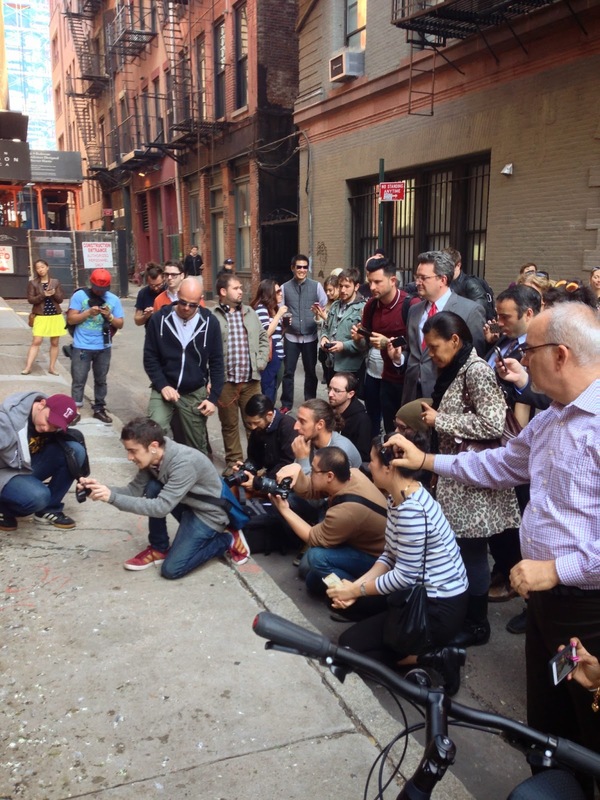 As the daily pieces continued to be unveiled, on Oct 28th, New York City was introduced to the Banksy Robot. Coney Island was the next neighborhood to house a Banksy original, on Neptune & Stillwell Avenue. Closing in on the end of the month, I knew this was the last opportunity I would have. Coney Island is close to my heart, and my favorite summer spot. So I took the trip to the end of the subway line that afternoon. From my own photo, you can not see the painted pigeon hovering above the robot, who tagged a barcode with the nucleotide sequence for homo sapiens. Take what you will from this image, Banksy again invoked a compelling opinion on human existence. Are we just objects responding to stimulation? 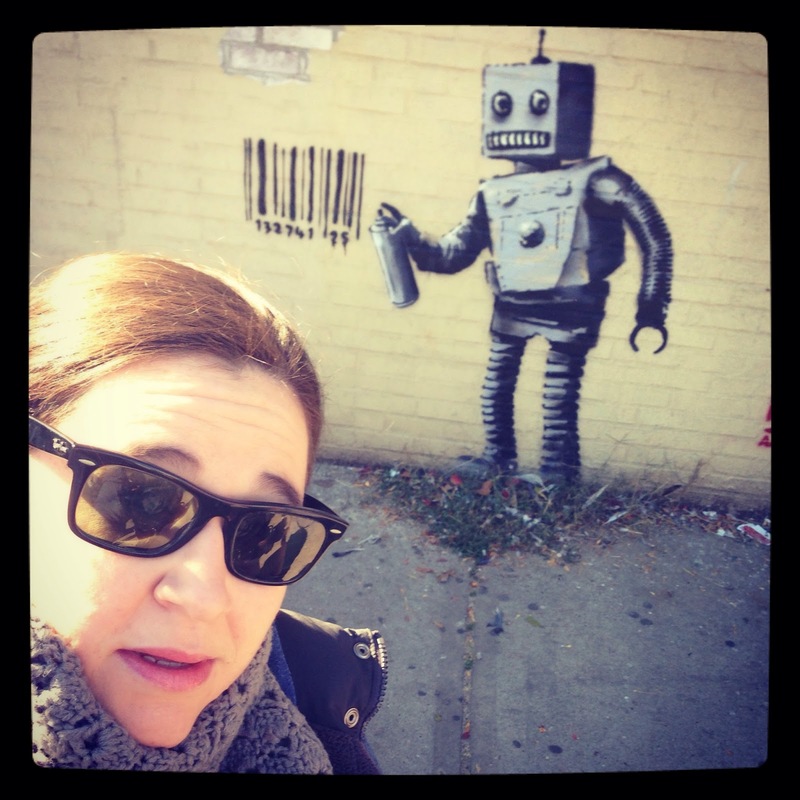 Are we all just social robots repeating trends, ideas and needs? Art will forever invoke emotions in us; and it's how we respond to it, support it, and revel in it - that really will define the future of the art world. No matter how rebellious and attacking the message is, absorbing it's message will change us no matter what. The real artists step outside of the box (or museum), and take chances. 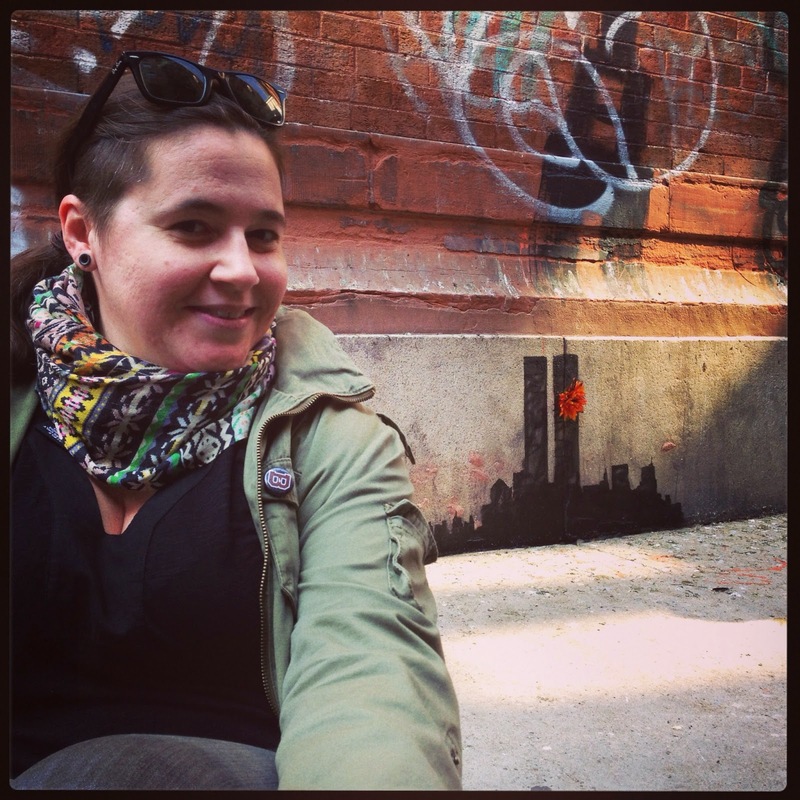 As I started writing this post, and gathering my photos from last year - I realized they were not my first "Banksy Selfie". I had forgotten about the photo I snapped in 2008, around the time of the presidential election. 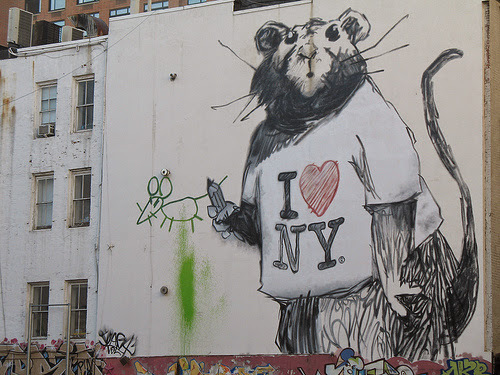 Banksy shared a few of his rats with us, this one was in SoHo on Grand and Wooster.